Setting up Ionic 2 with angular2-translate is pretty simple. But since there were a lot of changes in the recent time and most of the code examples provided in other blogs is already outdated i decided to describe the latest working approach. Currently i’m using angular2rc.1. Since Anuglar has reached RC status there should be no more breaking API changes and this approach stays valid. Ionic2 on the other hand is still in Beta. Im working with “ionic-angular”: “2.0.0-beta.7” *update* 2.0.0.beta.8 *update* (you can get this information from package.json). I’m working with TypeScript and you should too! Thats it – ng2 translate is now ready to use. Lets add it to home view – which is hello-ionic.html in my example. 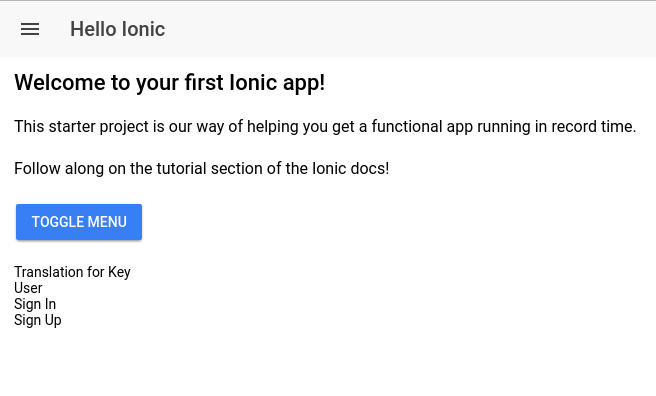 Follow along on the tutorial section of the Ionic docs! The last step is to add the pipe to the component. It is required for every component with usage of ng2 translate. If you miss it Angular will throw The pipe 'translate' could not be found. Its working for App page(lef menu. bottom tabs) for me … but not for subsequent pages. So when I open a.g. AboutPage, it doesnt know anything about selected language and I have to do setup once again which is not nice. It seems to me that ‘TranslateService’ is created as a fresh object for every page so I’m loosing the setup and current language info I made for App. Any hint? you are totally right. I’ve updated the example repository from Ionic beta 7 tobBeta 8 and solved the issue by referencing the provider in the ionicBootstrap method. See end of app.ts in the github repo. I’ll update the blogpost tomorrow. Hi Kevin, i’d really advise you to use typescript. Almost all of the Angular2 and Ionic2 stuff is made with TypeScript. It might be hard to dive into on your own but it is definitely worth it. i go throw steps, every thing fine for “en” but i cant change the language. i think the browser use its default language. – I read somewhere that angular 2 will have its own translation system, which has not yet been published. Does it worth to implement ng2-translate if the integrated solution comes with the final release (this summer ???)? – Instead having one big translation file by language, which is hard to maintain, I’d like to have one translation file by page. Is it possible and how to do it? i’m not too familiar with the angular 2 i18n module but i think it is included since RC2. See node_modules/@angular/compiler/src/i18n/ in a updated project or visit the Angular2 GitHub Repository. So I’d recommend to wait if this is possible. I’ll think about writing an article about angular 2 i18n as soon as the docs are better. Having a translation file per page is not so good since it would become redundant quickly. Like button labels etc. So this is really not recommended! But there are tools that you can set on top of your workflow to manage i18n JSON generation, most of them require a monthly fee. Hello! You can try https://poeditor.com/ to easily translate your app or other piece of software into other languages. It has a simple and intuitive work interface, and many useful features: API, translation memory, WordPress plugin, Bitbucket and GitHub integration. Could you, please, provide a license to your code? I am getting peer dependency error when I am trying to install ng2-translate. this is because the current ionic versions (beta 11) relies on Angular RC 4 while the latest ng2-translate version already runs with RC 5. You can update ng2-translate when the Ionic Beta is on RC 5.
working great, thanks for the tutorial. how would you translate text directly in the controller instead of view (for an alert for example)? Hi it’s very useful , a lot of thanks . Hi I take below mistake , Can you help me .